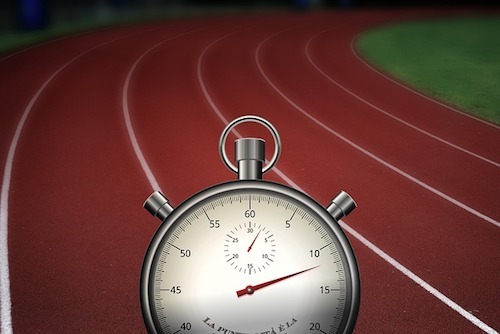 In today’s article we look at speed. Which is the fastest animal of all? Well you might be surprised actually. It is impossible not to be impressed by speed. Speed keeps you one step ahead of everyone else, and in the animal kingdom, this means much better chances of survival. When it comes to speed in the animal kingdom, there is as much debate about which animal is the fastest in the world, as there is about who the greatest athlete of all time is, or who the fastest runner is. To make a fair comparison between the different sizes of animals, you have to measure speed in body lengths per second. This creates a completely different list of results dominated by incredible mini-beasts! If you are looking at body length per second, the fastest animal is the South Californian mite, reaching a speed of 322 body lengths per second. If the mite were to be the same size as the average human it would run at a speed of about 1,300 mph (2,092 km/h). Compare this to a cheetah which can run at about 16 body lengths per second and you can see how fast this actually is. That makes the South Californian mite about 20 times as fast as a cheetah, IF you compare their speeds to their body sizes. If they were the same size the mite would leave the cheetah eating its dust. In reality, the insect is so small that it wouldn’t be able to keep up with a cheetah, but it’s a cool fact to tell your friends. 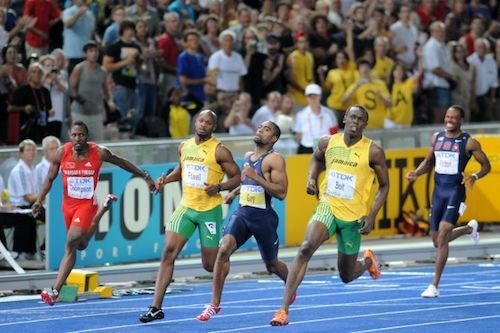 If you are wondering who is the fastest human in the world, it is Usain Bolt. His quickest recorded speed was 27.8 mph (44.7 km/h) at the Berlin World Championships in 2009, where his average speed was 23 mph (38 km/h). Compare Bolt to the other fastest animal on two legs and the difference is hard to see. Bolt could well have been nicknamed the ostrich, because their stats, when it comes to speed, are pretty hard to tell apart. But we’ll come back to how fast an ostrich can run later. So to return to the original question, if a cheetah is not the fastest animal in the world, what is? Let’s take a look at the speediest animals on the planet. Cheetahs? If you thought the fastest animal on earth was the cheetah, you may be surprised to find out that there are a number of animals who can outshine the cheetah when it comes to speed. 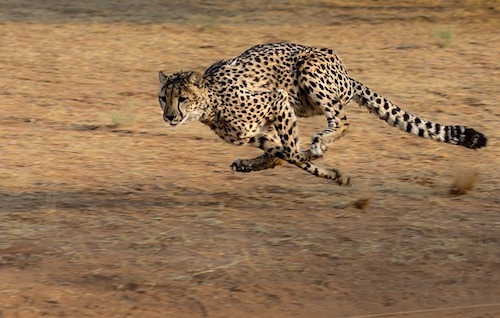 Let’s take a look at the fastest animals in the world – you’ll be amazed to find cheetahs much lower down in the list. The fastest bird in the world is the peregrine falcon. Found all over the world, the peregrine falcon has a top speed of 242 mph (389 km/h). Compare that to the fastest car in the world, the Koenigsegg Agera RS with a recorded fastest record of 278mph, possibly, about to be usurped by the Hennessey Venom F5, said to be able to reach speeds of 301 mph (a record not yet tested by the Guinness Book of Records). At its fastest when diving, the peregrine is a deadly predator that snaps the neck of its prey with an unusual hooked beak. Climbing high into the sky before it makes its record-breaking descent, it is able to reach incredible speeds on the way back down. Found all over the world, both in cities and in the wild, the peregrine feeds on small birds, mammals and reptiles. Golden eagle: reaching a top speed of 200 mph (320 km/h), the golden eagle is another deadly predator. Known for its sharp claws, it is able to crush the bones of surprisingly large animals. White-throated needletail swift: travelling at a speed of 105 mph (169 km/h) at its fastest, the needletail swift loves being in the air – it even eats whilst flying! Eurasian hobby: a fast, agile falcon, the hobby is able to hunt and eat when it is in flight, feeding on small birds, bats and insects. The ostrich exists in a category of its own. How fast does an ostrich run? 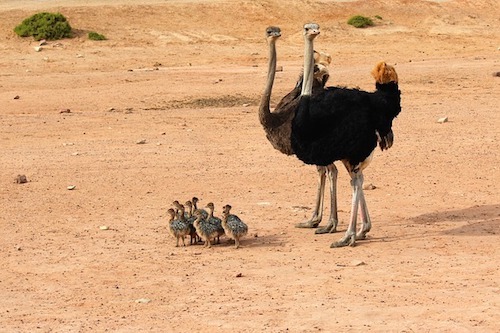 With its tall frame and heavy body, you may be shocked to learn that the ostrich is the fastest animal on two legs. Found all over the Africa continent, it can’t fly, but it can run at up to 45 mph (72 km/h), if jogging it can travel for 30 minutes at a speed of 30 mph (48 km/h). When it comes to the question of the fastest fish in the world, there is a tough battle for first place between the black marlin and the sailfish. Both equally deserving, it is simple a question of time spent in the sea, for that reason, I have sided with the marlin camp, because the sail fish’s top speed is reached whilst leaping in the air. The black marlin has a record-breaking speed of 80 mph (129 km/h), it can be found racing through the Indian and Pacific oceans. Easy to catch, it hunts near the surface of the water, and is around 4.65 m long. Sailfish: with a stunning appearance, the sailfish has been known to swim beyond 68 mph. Its unique appearance comes from the sail which runs down the length of its back and rises up to intimidate its prey. It has a very long beak, useful for hunting, and reaches its highest speeds when it leaps into the air. Swordfish: a fiercesome predator, it has some of the best vision found in any sea creature. Found in the Atlantic, Pacific and Indian oceans, it has a super quick speed of up to 60 mph (97 km/h). Wahoo: found in the warmest parts of the world’s oceans, wahoo can reach speeds of up to 48 mph (77 km/h), to catch its prey. The fastest animal on land is the cheetah. Found all over the African continent, cheetahs are sprinters who can reach dazzling speeds of up to 75 mph (121 km/h). Slight in frame, cheetahs are able to accelerate from 0-60 mph in less than 3 seconds, although these bursts of energy only last for 60 seconds. For longer periods, their average speed is around 40 mph. With a love for hunting, cheetahs spend most of their time in pursuit of prey, tripping over any unfortunate victims, before biting the victim’s throat so that it chokes to death. Pronghorn Antelope: unlike a cheetah, a pronghorn can keep its speed over long distances and is able to run at 35 mph for up to 4 miles. For short distances, pronghorns can reach 55 mph for half a mile. Fast to keep it safe from harm, pronghorns are found in North America and have a large windpipe, heart and lungs to take in lots of air when it is in flight. Its only disadvantage is that it is not very good at jumping. Springbok: a graceful animal found in Southern Africa, springboks have long legs and can run up to 55 mph (88 km/h). Most active during the quieter times of the day – at dusk and dawn – springboks are known for their pronking and can live without water for years. Wildebeest: found in southern Africa, wildebeests are endurance runners, able to travel at 50 mph (81 km/h), or more for long distances, to keep themselves safe from predators. So which is the fastest animal on the planet? Topping the leaderboard is the peregrine falcon at 242 mph (389 km/h), closely followed by the golden eagle at 200 mph (320 km/h) and the white-throated needletail swift at 105 mph (169 km/h). All birds – not a cheetah in sight, unless of course, the cheetah ever decides to grow wings and take flight. Then we really will have a fight on our hands. Do you agree? Do you think we should look at animal speeds by body length per second? Would you put the black marlin ahead of the sail fish? Tell us what you think- we would love to know! Don’t forget to follow us on Facebook to see more posts like this on a daily basis. We publish all sorts of interesting reads about things like Pearl Harbor too.